Essential oils are an effective way to re-grow hair naturally because they stimulate, soothe, and repair the hair follicles. Essential oils are also great for fostering a healthy scalp, as many of them have cleansing and healing properties. Some of the most popular essential oils used in hair care are rosemary, lavender, peppermint, and cinnamon. Let’s look at why! Rosemary encourages hair growth, alleviates dandruff, and makes hair dark. Lavender is used treat scalp issues. Peppermint is excellent for thinning hair because it helps to stimulate blood flow to the root of your hair and doing so gives it good nourishment and growth. Cinnamon essential oil is great for hair shedding and scalp stimulation as well. Since essential oils have a very low risk of side effects and are quite inexpensive, adding any of these to your current products may help you get past plateaus. 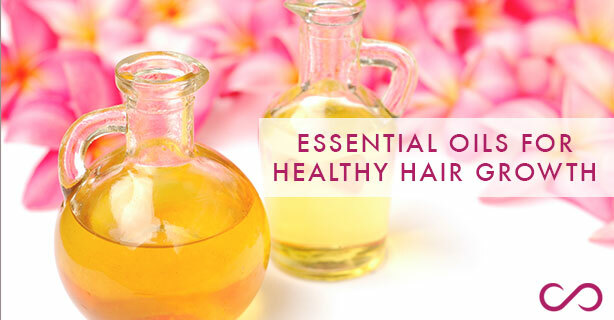 There is an essential oil available for nearly every hair or scalp problem. But remember that essential oils are far too concentrated to be used directly on the skin or hair, so it’s best to dilute them with carrier oils like almond, safflower, sesame, coconut, avocado, or olive.